This wall honours more than 35,000 Australians who were held prisoner during the Boer War, the First World War, the Second World War and the Korean War. 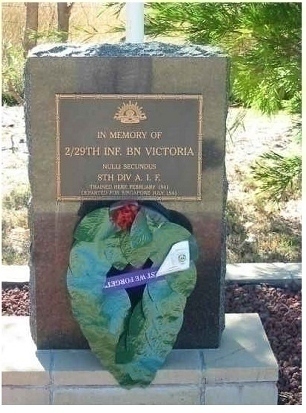 Between the Boer War at the turn of the last century and the Korean War in the 1950's, 34,737 Australian servicemen and women were incarcerated in Prisoner-of War (POW) camps. Many suffered inhumane and atrocious treatment from their captors. To this day there is no Memorial in Australia such as this dedicated to these Australians or any recognition of their pain and suffering endured in the service of our nation. The motto of these brave prisoners was "When you go home, tell them of us and say that we gave our tomorrow for your today". A memorial has been built in the Botanical Gardens in Ballarat. The Bathurst Army Camp memorial is situated at the entrance to the Bathurst Sheep and Cattle Drome, 624 Linekiln Road, Rossmere Park, Forrest Grove, Bathurst NSW 2795. The 2/29th Battalion A.I.F has two memorials at the entrance to this former camp including a wall plaque and Battalion memorial tablet. The property was an Army camp from 1940 until the end of World War ll. The wall of concrete bricks (as seen below) carries a number of unit plaques. There are 21 plaques on the wall and the 2/29th plaque is number 17. Also located at this memorial is a granite tablet dedicated to the 2/29th Battalion A.I.F. It sits on a concrete brick plinth in a raised bed of scoria and there is a flagpole behind. 8TH DIV. A. I. F.
The 2/29th plaque was dedicated on 18 February 1993. A bus load of approx 40 - 2/29th Diggers and their partners went from Melbourne to attend the ceremony. Charles Bean first began thinking about commemorating the sacrifice of Australians in war in 1915 on Gallipoli. The idea of a national museum took hold later, while Bean was visiting Pozières, France, where the Australian divisions suffered 23,000 casualties in less than seven weeks of fighting in 1916. Bean's idea was to set aside a place in Australia where families and friends could grieve for those buried in places far away and difficult to visit - a place that would also contribute to the understanding of war itself. Both commemoration and furthering our understanding of war inspire our work at the Memorial today.